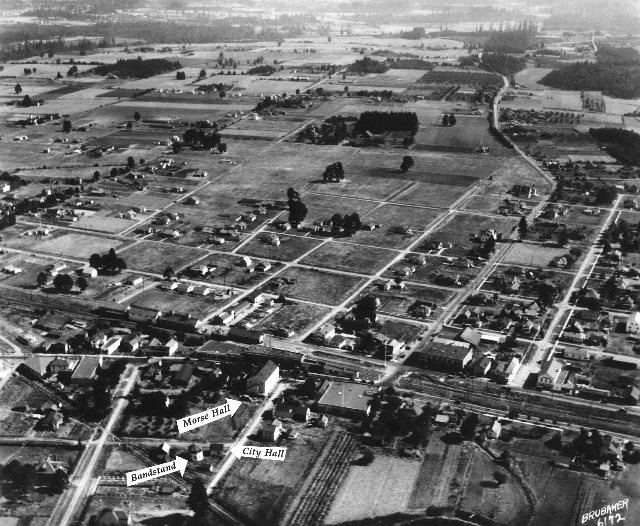 Photo: Beaverton in the 1920s looking South. Watson Avenue can be seen stretching off into the distance. Angel Street furthest street to the right of photo. 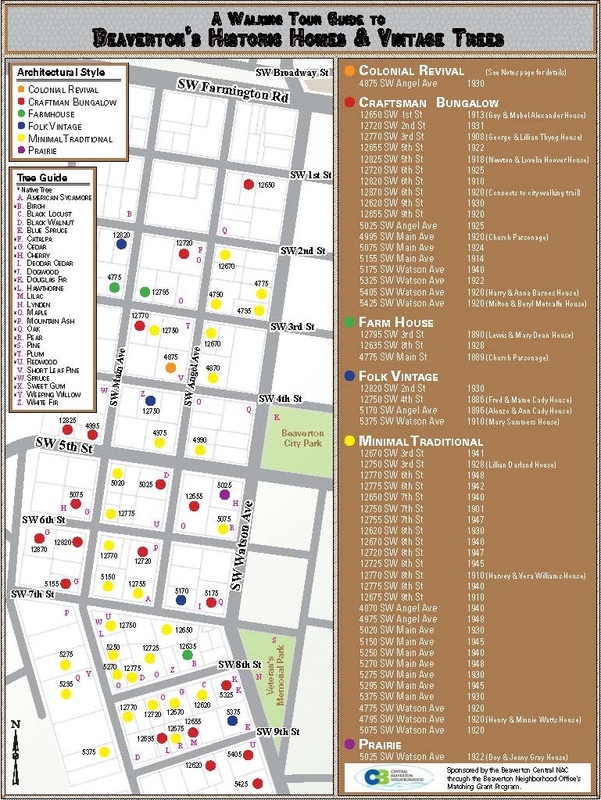 Your self-guided walking tour will span about 50 years of residential construction from the 1890s to mid-century. You will see significant changes in architectural styles and homes once occupied by influential individuals and everyday wage earners. The earliest Euromerican settlers made use of available resources to build their new lives. In timber-rich Tualatin Valley that meant log cabins and wood-frame structures made from milled or hand-sawn planks. Once they had a roof over their head, they turned their attention to making a living. Most were farmers. Washington County’s fertile bottomlands, enriched by beaver dam soil, produced a diverse crop of onions, nuts, apples, prunes, potatoes, and dairy products. Although Beaverton’s economy didn’t rely on timber as a dominant factor, sawmills were an important source of income. Dense fir and cedar forests supplied mills that produced shakes, shingles, railroad ties, lumber for the town’s buildings, and cordwood. Wood was the sole building material for several decades after settlement, used to erect serviceable homes and commercial structures. Residential construction reflected current national styles, owners’ preferences and budgets, and know-how. Sears, Roebuck & Co. offered kit homes from 1908-1940 in their “Modern Homes” division. Prospective homeowners could peruse a special catalog, choose from about 400 available designs, and order the plans and construction supplies. Prices ranged from $900 to about $4,500 in the 1920s. Residents of the area’s small rural towns needed goods and services. Before long, a blacksmith, wagon and carriage maker, store to buy tools and food they couldn’t grow, physician and pharmacy, post office, and shoemaker had set up shop. By the time Beaverton incorporated in 1893 with a population of 250, it had begun its journey to the vibrant suburban city of today. Now Washington County’s second largest city, Beaverton began as a supply center for the area’s agricultural products when railroad baron Ben Holladay agreed to construct a depot here. There was a condition: townspeople had to build one commercial structure first. George Betts erected a log building, established a store and post office in 1871 and the railroad arrived as promised. From here fruits, vegetables, and railroad ties were transported to Portland for national distribution and residents rode the train to points east and west. The town remained a quiet village, reaching a population of 580 in 1920, until the Roaring Twenties when automobiles replaced passenger trains and suburbs began to grow. Elegant and classic, this popular symmetrical style reflects a sense of tradition. Siding is brick or wood and roofs are usually side-gabled, but can be hipped. Multipane windows, one-two stories, columns or pilasters that frame a central front door, and a rectangular shape characterize its timeless features. It was especially fashionable between 1880-1960. The Arts and Crafts Movement originated in Victorian-era England as a reaction to industrialization and mass production, emphasizing beautiful workmanship, individuals’ skill, and attractive design in furniture and decorative arts. It flourished in the United States beginning in the 1890s. Often referred to as Mission style in America, it is characterized by a low-pitched gable roof, deep roof overhangs, tapered porch columns, native woods, and traditional form. Dormer windows, front and side porch, windows with multi-pane tops and single-pane bottoms are associated with this style. Interiors are traditional and free-flowing. It was easy to build and maintain, and affordable. A steeply pitched roof, wide front porch, practical exterior and interior features, and informality typify the farmhouse. The name recalls America’s agrarian history when these homes were the center of family farms, built out of whatever materials were close by. Straightforward, welcoming, and functional, they could also have outbuildings that might have included barns and sheds for tools and farm equipment. Folk Vintage is a sub-style of Queen Anne architecture that didn’t usually retain the multiple dormers and gables, abundance of ornamental detail, elaborate turrets, “gingerbread”, and eclectic mix of forms that define the original elements. Working or middle-class families adopted their own versions of Queen Anne: simplifying and making them smaller, incorporating square and straight lines, eliminating complex geometrical shapes, but retaining oriel or bay windows. This design flourished from the 1880s – 1910s. This style replaced the bungalow and was popular from about 1925-1950. It’s usually small –about 800 square feet, 1 or 1 ½ stories, and has simplified features, a substantial chimney, and separate garage. The quality of the workmanship was upheld, however, and these houses were especially popular with middle-class homeowners. Frank Lloyd Wright pioneered this architectural style to reflect and blend in with the wide open, flat spaces of the American Mid-west. Its horizontal lines and low-pitched, broad roof, open floor plan, and expansive, horizontal lines define a design that first appeared about 1900. It is an American original that has two stories and in some elaborate variations, projecting rooms and protected terraces. The photo was originally identified as “Beth. Cong.”, a reference to Bethel Congregational Church, established in the early 1880s in Beaverton. In 1925 the church relocated to property it had purchased on Watson Street. The house was built in 1920 and it’s likely that it was used as a parsonage. Mabel Clara Summers wed Guy Scott Alexander in Portland in 1913; he was 24 and she was 22. After a brief honeymoon the couple moved to a house in the southeast part of the city, but by fall 1915 they had relocated to Beaverton. The popular couple quickly became prominent in the social scene, hosting parties and traveling with friends. In the 1910s he was employed as a glazier and supervisor for W.P. Fuller & Company and Fisher-Thorsen Company, commuting to Portland while conducting a personal business that repaired and replaced broken glass in Beaverton. He immediately joined the Beaverton Masonic Lodge # 100 and later served as town councilor and election board clerk. Their daughter Evelyn was born in 1918. 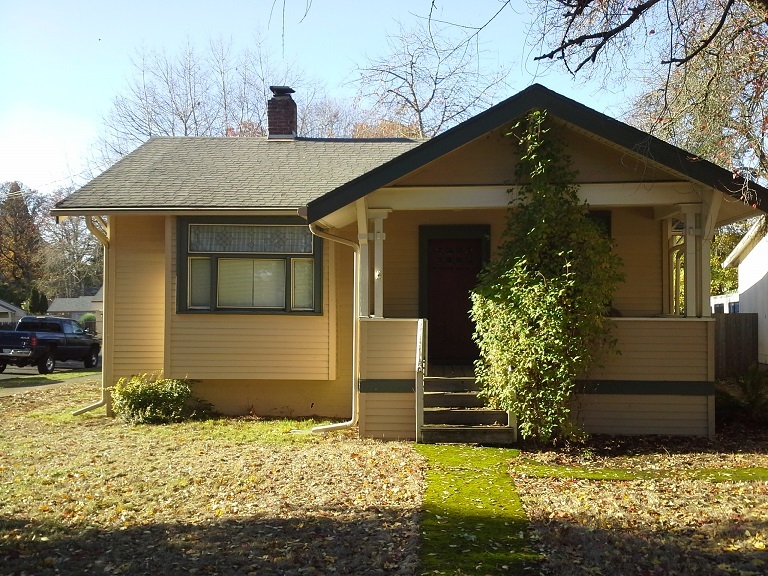 Built in 1928, it has been has been informally referred to as an example of a “Beaverton Bungalow” with a clipped gable on the house and porch, weatherboard siding, and an oriel window. The residence is identified on the 1980s Beaverton Historical Resource Inventory as the Darland house, ostensibly after an early occupant named Lillian Darland. The connection needs additional research. Her second husband, George Thomas Darland (1857-1935) , was a Doctor of Chiropractic and Naturopathy who practiced in eastern Oregon before relocating to Washington County and establishing offices in Forest Grove and Hillsboro. 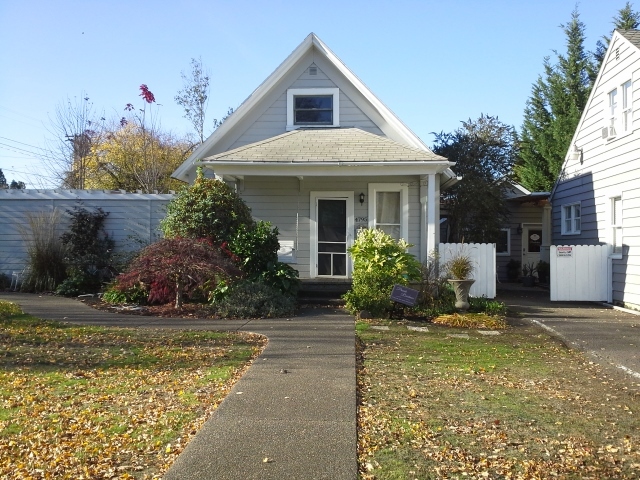 Dr. Darland was residing in Forest Grove in 1920 with his wife Mary (1860 -1924) and in Hillsboro in 1930 with his wife Lillian, who moved in with her daughter and son-in-law, Edith and Willis L. and Cady, after Dr. Darland’s death. Born in 1871, she died June 2, 1946 at the Cady home on Angel Street. After services at Bethel Congregational Church in Beaverton, she was buried in Forest Grove. The Thyngs were among Beaverton’s most well-known residents, active in the business, social, and faith communities. George (1873-1961) was the first City Recorder, registrar for the United States Draft Registration Board during World War I, mayor, election board judge, and owner of Beaverton Confectionary. He also managed the Beaverton baseball team, served as Justice of the Peace and city water superintendent, and had worked as typesetter on the town’s first newspaper, Oscar Thayer’s Chronicle, in the 1890s. They also owned the Beaverton (later, Commercial) Hotel for a short time in the first decade of the 20th century. The confectionary on Broadway Street was central to town history. 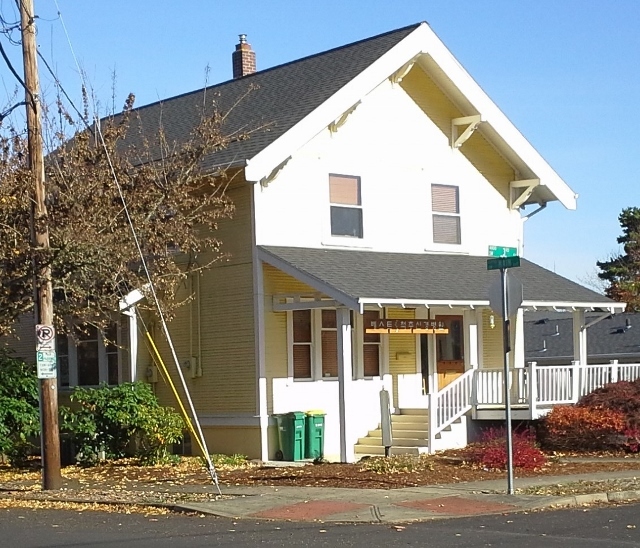 Here was a place residents could buy gasoline and sign petitions, including a 1919 effort to re-open and spruce up the Oregon Electric Rail depot. The sweet shop had pool tables, sold candy, cigars, ice cream, and sodas and housed the town’s first phone exchange. Lillian, who had been married previously and had a daughter, Vena, from that union, was the first telephone operator. She served on the election board in the 1920s and later clerked in the confectionary. Her legendary banana splits made with homemade toppings layered over ice cream were available only during the summer and eagerly anticipated by locals. She and George had a daughter, Rhoda, who died in 2014. According to his draft registration card, George had lost his right foot by 1918 from an unidentified cause and was therefore not physically fit for military service during World War I. Born on December 16, 1873, he died December 16, 1961, the 88th anniversary of his birth. Lillian, who was twelve years younger, died in 1966. This 1890s Craftsman building well represents an adaptive use of a historic home that successfully bridges past and present. This building is often referred to as the William and Mary Hunter home. Census records indicate the Hunters and their children lived on 3rd Street in 1910, but had moved by 1920. He was a teamster, a person who drove a team of horses pulling a wagon, usually hauling freight or making deliveries. It’s unclear if they built the residence. Lewis and Mary Dean and daughter LaMerne moved there in late 1918 or early 1919. The Deans settled in Beaverton about 1914 after a brief stay in Marshfield (Coos Bay) and North Bend where he clerked in drug stores. He and a business partner soon established the City Pharmacy in the Cady Building on Farmington Road. Later renamed Dean’s Drug Store, it compounded prescriptions, sold home remedies, and served Beaverton through good times and bad, Prohibition, and two World Wars. The astute businessman and member of the National Association of Retail Druggists advertised often in the local newspaper and sponsored a variety of promotions, including a free goldfish giveaway with every 25 ¢ purchase in 1919. The same year he and all NARD members began preparations to comply with national Prohibition laws that controlled the production, distribution and sale of intoxicating liquors, including prescription drugs from 1920-1933. The national regulations made alcohol illegal, but allowed pharmacists to fill prescriptions for medicinal purposes. Lewis died in 1937 at age 48 from the effects of a stroke he’d suffered a few years earlier. Survivors were Mary, son Harold, and daughter LaMerne. Prominent and popular, he served on the school board, officer in Beaverton Home Guard during World War I, belonged to the Masonic Lodge and International Order of Odd Fellows, and advocated for educational improvements. Maria (Mary) Johanna Dietsch Long Dean entered into a brief second marriage, continued to operate the pharmacy, and christened a ship with Mary Barnette at the Swan Island World War II shipyards in Portland until her 1952 death. Dean’s Drug Store, by now renamed Dean’s Rexall Drugs, stayed in business through the 1970s. 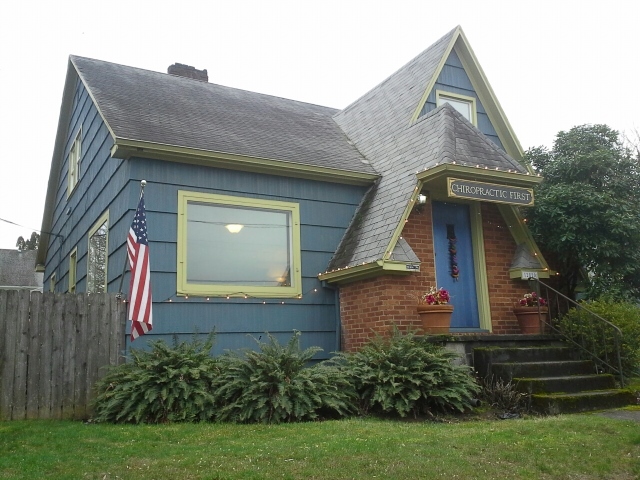 One of Beaverton’s most prominent historic buildings was erected in1914 by F.W. Cady. The two-story brick structure was renowned in its day and continues as a landmark in Historic Old Town. Native to Wisconsin, his family moved to Kansas where his mother died in a tornado. F.W.’s next destination was Portland where he graduated from business college before returning to Kansas and marrying Mary (Mame) Hills. The little group—wife, father, stepmother, brother–traveled back to the West Coast relocating to Beaverton in 1892, the year before the small settlement incorporated. His accomplishments during the next three decades were extraordinary. He initially partnered in a mercantile called Cady-Anderson, “The Satisfaction Store”, and then with town undertaker W.E. Pegg in another general merchandise business. Customers ordered goods which were delivered throughout the countryside. F.W. often hitched up horses to a wagon and went to Portland to pick up supplies, an all-day journey that required leaving early in the morning and returning late at night. Mame was especially interested in music, but family was her priority. Active in politics, fraternal organizations, and business, he was affiliated with the local and state Republican Party, served several terms as Beaverton mayor, and acted as town treasurer. His social memberships included United Artisans and Beaverton Masonic Lodge #100 where he was Worshipful Master, and Chamber of Commerce Board of Directors. F.W. was a highly successful businessman: Postmaster for 20 years, potato and onion broker, Southern Pacific Railroad agent, partner with E.G. Anderson and later, W.E. Pegg in general merchandise stores. Complications from a 1925 car accident took his life , compelling Mame to take in boarders—mostly teachers–, at the Angel Street home. F.W. (1861-1925) and Mame (1866-1931) are buried at Lincoln Memorial Park, Portland. Newton and Lovelia Hoover bought their home in 1918, living there until tragedy struck two years later. In 1920 the Southern Pacific section foreman was among nine killed when two Red Electric Railroad passenger cars hit head on near Bertha depot and siding. Approximately 100 passengers on the interurban train were injured, many seriously. His funeral was held at Bethel Congregational Church in Beaverton about one month after he had celebrated his 34th birthday. He was buried in Forest Grove. He was survived by wife Lovelia and two sons. An infant daughter had died one day after her 1908 birth. A siding is part of a rail line where one train pulls to the side on an adjacent track to allow an oncoming train to pass. It is now a strip of land on the east side of Bertha Boulevard near SW Chestnut Drive in Portland. The disaster has been described as the worst in Oregon interurban train history. 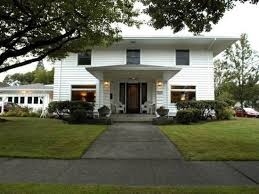 This 1910 Minimal Traditional house was formerly occupied by Harvey, his first wife Hilda and their son Robert. It sits on property that was part of acreage owned by his parents Rufus and Maggie Williams and originally encompassed several lots between SW Watson and SW Main. Rufus (1871-1946) was a native Kentuckian and graduate of University of Kentucky who came to Beaverton about 1900 with Maggie and their daughter Alpha, following in the footsteps of siblings who had settled in other parts of Oregon before him. Son Harvey was born in Beaverton in 1909. Rufus was a logger, railroad worker, sawmill engineer, small farmer, and brickyard laborer. Like many of their neighbors, they raised beans, corn, and potatoes for household use. A Mrs. Harris purchased that large property, but eventually sold it to Harvey Williams, returning it to family ownership. After Hilda’s death, Harvey married Vera. Harvey (1909-1986) played an important role in the Beaverton Fire Department, which was all volunteers for many years. Eventually the city council voted to pay: the chief received $3.00 per month and all other firefighters received 50 cents per fire and worked a 24-hour on duty and 48-hour off duty schedule. He rose to the positions of assistant fire chief and fire chief. Primary records are silent on the original usage of this property; it is known, however, that by 1909 the church owned it. 1916 and 1921 Sanborn Fire Insurance maps indicate this building on this site with the same façade. The then-homeowners in the 1980s stated to an interviewer their residence had been previously used as a parsonage through the 1930s . They bought the property from the husband’s parents, who in turn, acquired it about 1940. It is one and one half stories with two wood posts supporting an upper porch. The M.E. merged with two other branches in 1939 and formed the Methodist Church, which in 1968 joined with Evangelical United Brethren to form United Methodist. First mayor of Beaverton. Washington County treasurer. Boot and shoemaker. Born in New York state, Alonzo Brockway Cady married Eliza Gilbert, moved to Wisconsin, served as postmaster and owned a mercantile in Omro, attained the rank of First Lieutenant in the Civil War, and moved to Kansas. The couple had two daughters and three sons: one, F.W., carried on his father’s legacy of civic service and business ownership in Beaverton. After Eliza’s death in a tornado, Alonzo married Ann Martin and relocated with family to Oregon, settling in Beaverton in 1892. He was elected mayor at age 69. A member of Bethel Congregational Church, the Masonic Lodge (Worshipful Master), and Grand Army of the Republic, he died at the age of 83 years, 10 months and 7 days. The couple are buried in Lone Fir Pioneer Cemetery, Portland. A.B.’s granddaughter told an interviewer in the early 1980s that this house was originally located in the middle of the block between 6th and 7th and Angel and Watson, but was moved to the current location about 1960. 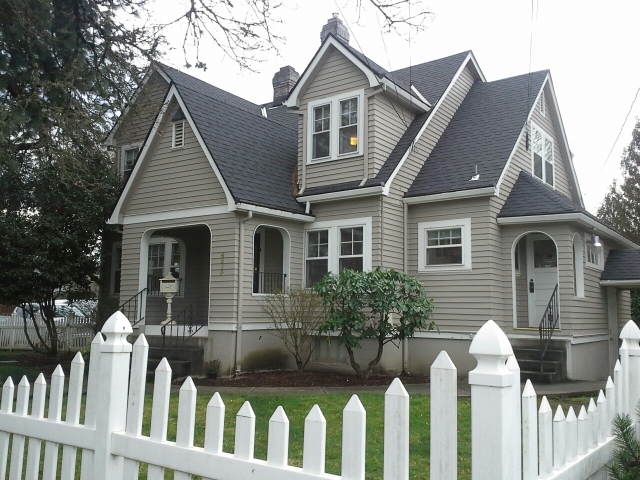 Built in 1900 and currently used for a business, this home on the corner of 3rd and Watson is on Beaverton’s Historic Resource Inventory. The Watts family consisted of Henry C. Watts, born in 1856 in Columbia County, Oregon; his wife Minnie, born in New York State in 1869; and five children: Alice, Genevieve, Ralph, Edith, and Mildred. Henry worked as a section foreman for Southern Pacific Railroad and then a watchman for the rail line’s electric shop on 5th Street. His mother, Mary Ann Spencer Watts– Beaverton’s first school teacher–traveled from Ohio to Oregon Territory via Cape Horn with her husband Peter in 1851. She taught school after his untimely death, later marrying William Watts, whose sister Ida Watts Burns was the tiny community’s second school teacher. The notable Spencer-Watts narration is well-documented and available in local history accounts. Clearly Henry had an interest in gardening. In 1917 he set out two everbearing strawberry plants in a 20’ x 30’ plot in their yard. In two years, they had multiplied and produced hundreds of plants and 200 boxes of berries that he sold at 8 cents per box; 70 dozen plants brought 40 cents per dozen. Total income was $44.00 ($611 in 2016.) His experiments continued for only one more year, transplanting wild strawberries he found growing along the railroad tracks, before replacing the berry patch with a fine lawn. Henry died Nov. 9, 1944 and Minnie on Aug. 11, 1957. His name is synonymous with the history of the Bank of Beaverton, established on Broadway Street in 1910 by four local businessmen. Nebraska-born Doy Edmund Gray (1877-1956) , first found employment as a railroad telegrapher before embarking on a financial career that spanned three decades. He was the bank’s respected head cashier (manager), then owner when he purchased it and relocated to the Cady Building. Business was good and a larger facility was needed. The fine-looking new building opened in 1929 across Watson Street in a Spanish Colonial Revival that’s now home to a dance studio. The 1933 national bank holiday ordered by President Franklin Roosevelt during the Great Depression shut down the national banking system and forced its closure. They took on leadership roles in civic, educational, and fraternal organizations: Jenny Gray nee Larson (1882-1959) was president of Beaverton Parent Teacher Circle and in one memorable play, the couple acted in a PTA-sponsored production of Ye Deestreek Skewl at the high school. They were active in the Order of the Eastern Star, he was Worshipful Master of the Beaverton Masonic Lodge, chair of the World War I Liberty Bond drive and city councilor. Their names regularly appeared in the social happenings columns of the local newspaper, entertaining guests or motoring to neighboring towns for events. Edgar Summers, a native of Illinois, arrived in Beaverton in 1898 where he joined the Masonic Lodge, Woodmen of the World, and city council. This skilled carpenter was responsible for several buildings in our community, including a contract to build the new St. Cecilia Catholic Church, then located on Canyon Road at Hall Boulevard. 53 year old Edgar died of appendicitis in an ambulance while being rushed to a Portland hospital in 1913. They had a son and a daughter: Robert, also an accomplished carpenter, and Mabel, who married Beaverton resident Guy Alexander. Mary Catherine Summers, nee Benner, was born in Iowa in 1870 and married Edgar in 1887. She died at home at age 64 in 1934 and is buried next to Edgar in Crescent Grove Cemetery in Tigard. Their descendants have said she worked as a seamstress to help make ends meet, characteristic in a time before there were social welfare programs and women were economically dependent on their husbands. Anna, born in 1896, and Beryl Metcalfe, born in 1901, were sisters, daughters of early Beaverton residents John and Matilda Peterson and siblings of Margaret, Carna, and Harold. Harry Mellen Barnes worked for Standard Oil as an intercity truck driver as a young man, then as a company salesman and distributor. Anna, who played on the first girls’ basketball team at Beaverton Public School in 1913, found employment as a bank transit clerk, and as a “transporter” who owned a business when she was in her early 40s. Milton Hoffman Metcalfe, a World War I U.S. Marine veteran, was employed by Ladd and Tilton Bank and later, U.S. Bank in Portland. It’s known that he and Beryl owned a 1931 Plymouth sedan in 1942, so it’s likely he commuted to the city until World War II mandatory rationing drastically limited consumer purchases of many items, including gasoline and rubber. The family owned a radio in 1930, a question federal census enumerators asked every homeowner for several years . He died January 26, 1966 and Beryl, two days later. They had been married almost 43 years. Dedicated in 2000, this one-acre site honors veterans of all military branches. American Legion Post 124 and the community celebrate Memorial Day and Veterans Day here annually amid monuments crafted from military objects. You are encouraged to reflect and honor sacrifices made by members of the United States Armed Forces.